Wind: Initially strong (15-20 kts) from the N, slowing after noon to more easterly. Comment: Philip Gerfaud was the only pilot aloft today. Tow pilot: Peter Mersino.Thank you, Peter. Don't forget, clicking on any photo enlarges it and shows all the other photos just as large. It was raining on the coast; it rained very hard and long in Fresno, beginning at 4:30 am, and continuing on until about 9:00 am. 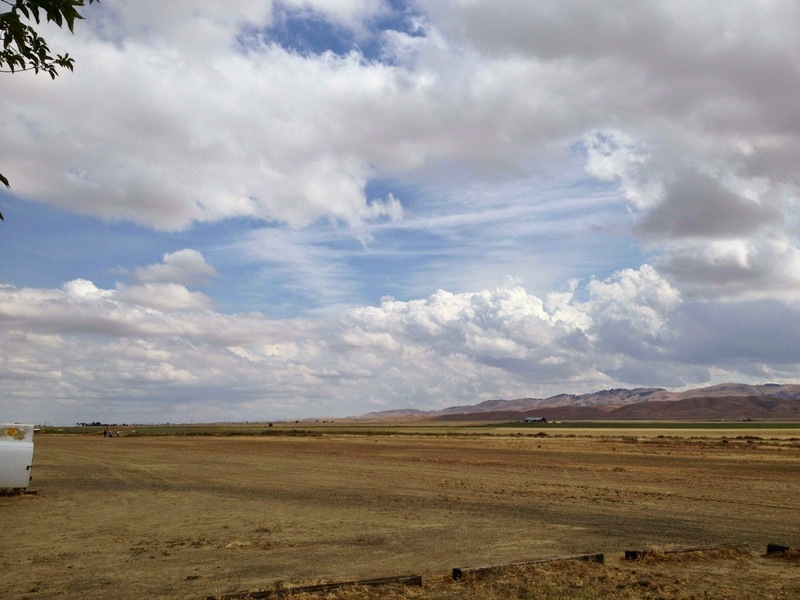 Low overcast (700 scattered, 1200 broken, 2300 overcast) with rain showers in the immediate vicinity of Fresno Chandler airport prevented an early departure. 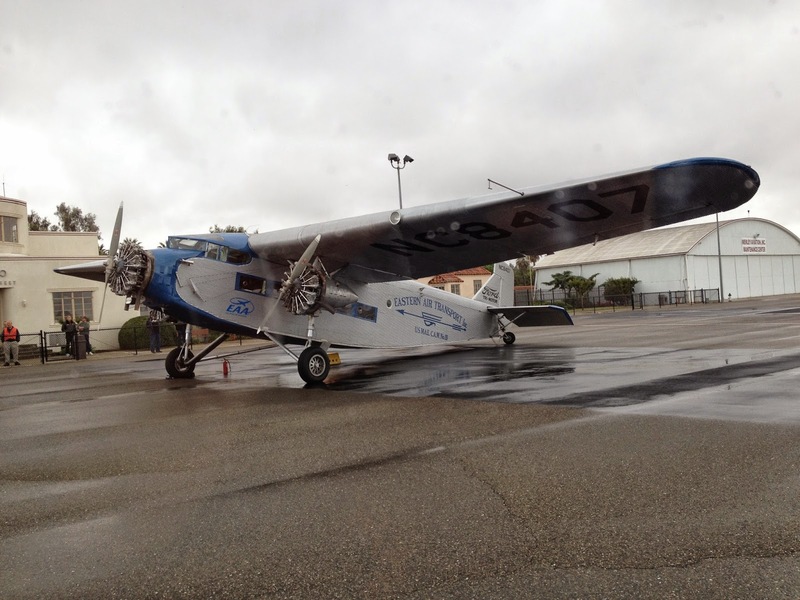 About the time the EAA Ford Tri-Motor took off for its first sightseeing flight around Fresno, the skies had begun to open a bit. Waiting for the rain and ceilings to improve for its first sightseeing flight around Fresno. Peter Mersino, Harold III, and I lifted off for Avenal. Earlier Jan Zanutto had phoned that the runway at Avenal was bone dry and that provided the necessary encouragement to head over that way. Otherwise we had given serious thought to scrubbing the flight altogether. Good thing we didn't, otherwise Philip Gerfaud and his parents would have made that long trip from Santa Maria for nothing. Just about to depart Fresno Chandler for Avenal in low ceilings. The day at Avenal promised to be good soaring. Puffy clouds all over the place with lift under most. 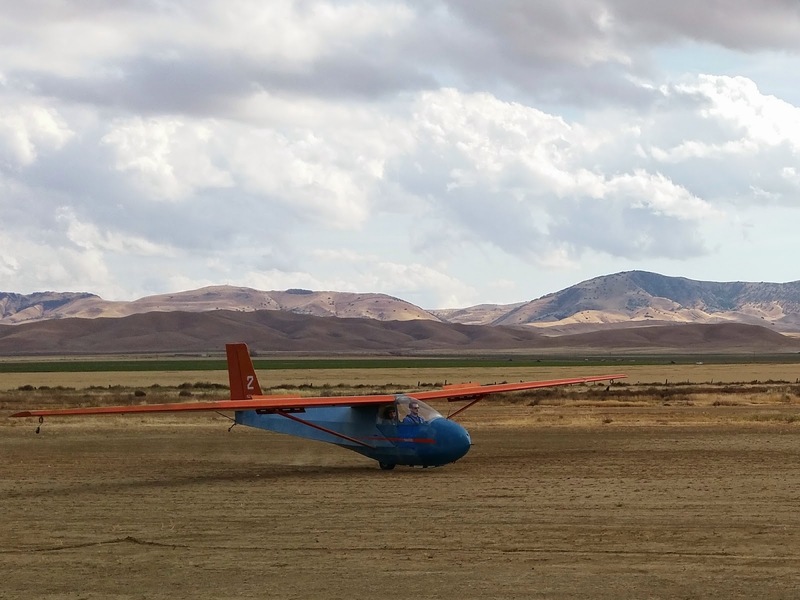 The wind was strong when we landed and provided good cross-wind practice for both tow plane and glider. We thought there'd be more pilots out there due to the lift after the frontal passage, but alas, no one, except the good guys who were working on Big Bird, reassembling. Martin Caskey, Jan Z, Pancho H, and some others I might remember after I write all this. Good looking clouds moving NW to SE. More well developed cumulus to the south coming in from the SLO area. Finally Philip showed up with his parents, Tony Handley, and Patty, his Mom. They both live in France near another gliderport I visited back in 1998 or 1999, Fayence, just north of Nice. 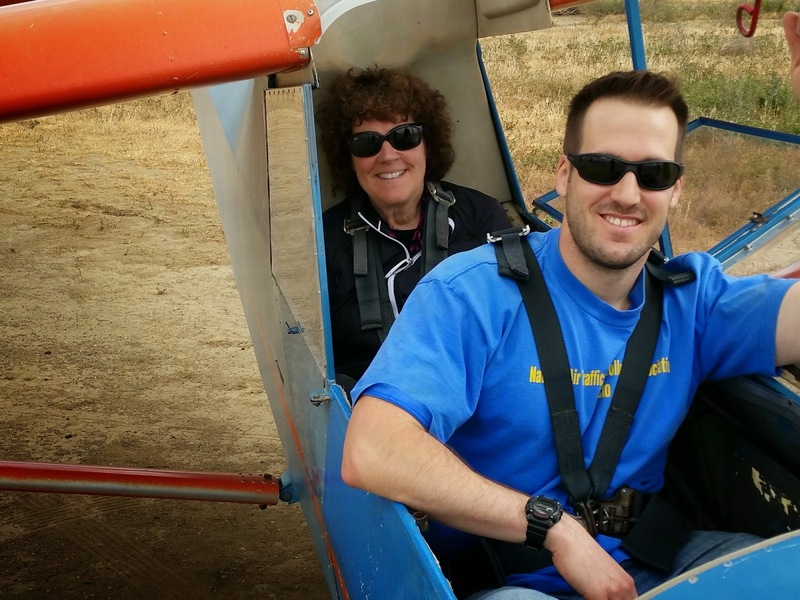 Tony has been flying there but Patty hadn't had much of a chance there, so Philip was happy to give her the first glider ride of her aviation experiences. Just after noon, Rick Eason showed up from Merced to join the club and get his add-on rating. Rick Eason and his buddy flew in from Merced in Rick's Cessna 172, shown above. Rick wanted to fly a demo flight and since our combined weights were above gross weight limits, I suggested he fly with Dan Gudgel or Alex Caldwell, both of whom were on the schedule today. Neither showed up, but Rick joined the club anyway and plans on returning as soon as possible. Welcome to our club, Rick. The saga of the day concerns Patty and her first glider flight. But first, she and I had a good time comparing notes on the patio about our similar schooling in Illinois. We both attended the University of Illinois in Champaign-Urbana although a few years apart, and then lived probably 50 or 60 miles from one another, she in Peoria and me in the Chicago area. Great conversation and I hated to see her leave, heading back to France when we might have stumbled on more common notes and experiences. Patty had way more interesting experiences than I and just barely began talking about how she is hired by the French government doing interesting work, also requiring her to give seminars at various venues, especially here in the U.S.
Patty in the backseat and Philip flying in what turned out to be a very nice flight. When my parents lived in the Alps, they were big into hiking and my mother would tell stories of gliders that would soar a few hundred feet off the cliffs they were standing on. 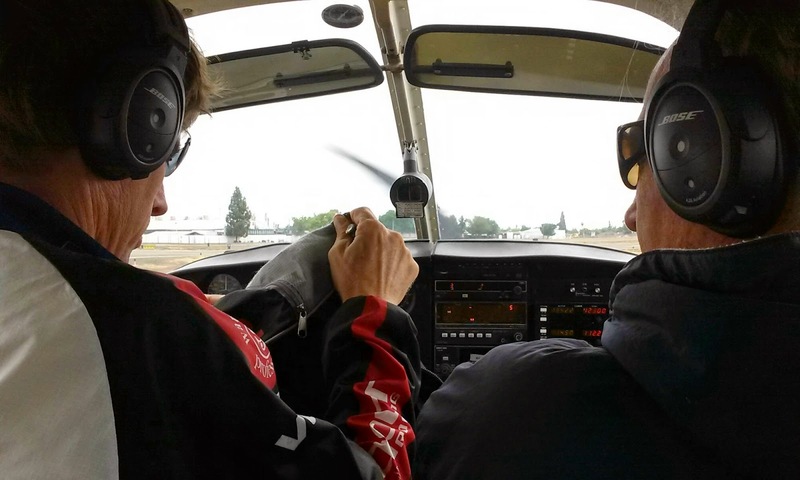 She always wondered what it would be like to fly in a glider and made it a goal to someday get her glider pilot’s license. When life got in the way (me), she was unable to pursue this goal. I started gliding many years later at age 15 in Fayence in the South of France, and we always talked about how she would be my first passenger (and many friends wanted to go flying too!). 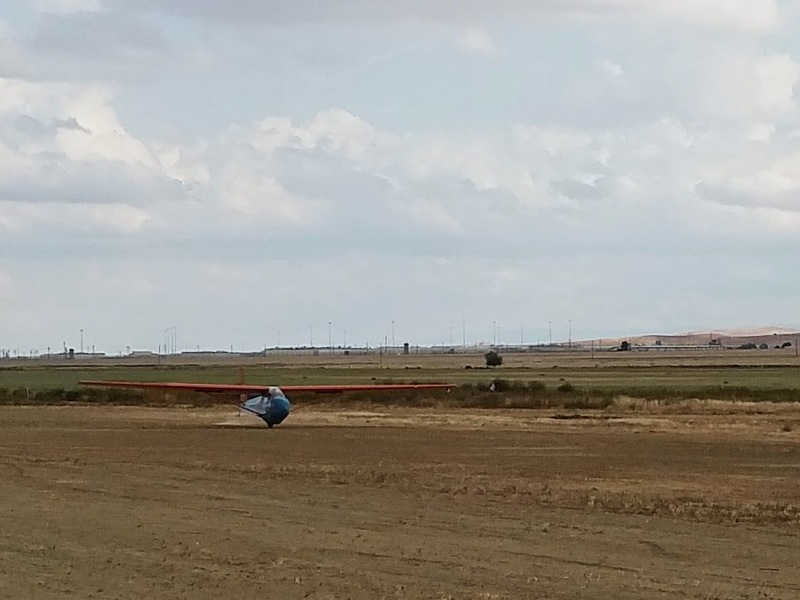 Tight club regulations on minimum PIC time to take passengers in gliders (100 hrs PIC) prevented me from achieving this minimum time by only a few hours when I left the area and moved to the States, so gliding with my mother never happened. My parents advised me that they were coming over to the States late April and I knew this was my opportunity to at last get my mother her glider flight. Last Saturday was the only day we had to do this and the forecast did not look good. We departed Santa Maria anyway, in moderate precip and IFR cigs, hopes still alive. I had planned a visit to Paso air museum if conditions did not shape-up. 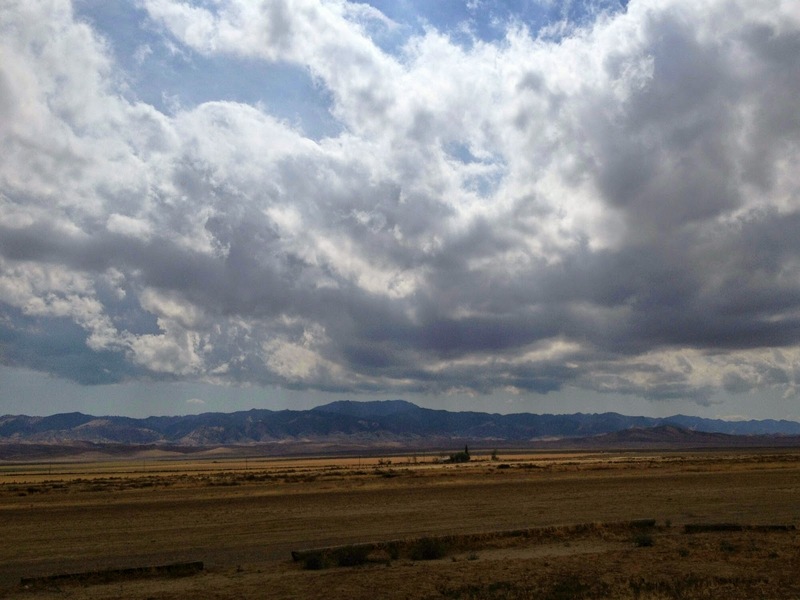 Once East of Paso Robles, blue sky opened-up above and the wind started picking-up. Much to my surprise, Harold advised me that Avenal hadn't received a drop of rain and Peter Mersino was ready to tow. Conditions were flyable despite a stiff northeasterly crosswind on Rwy 31. By 2 pm, the wind had calmed and conditions started booming. A quick backseat checkout with Harold revealed thermals marked by thick Cu and Harold speculated that some mild wave activity was present over Avenal from the strong northeasterly wind over the Kettleman Hills. The second flight was a 2000’ tow my step-father and I found small 2-4 kt thermals between areas of fairly strong sink. The third flight was a 2800’ tow with my mother and at this slightly higher starting altitude we found large areas of 1-2 kt lift increasing to 5-7 kts locally. These localized areas of stronger lift were fairly choppy and required tight thermaling but helped us rapidly gain 1000’. We were up for an hour but had to cut the flight short as a mandatory visit over to Parkville was planned to have a look at the San Andreas fault. My mother did not get to be my first passenger last Saturday, but she certainly got the longest flight! 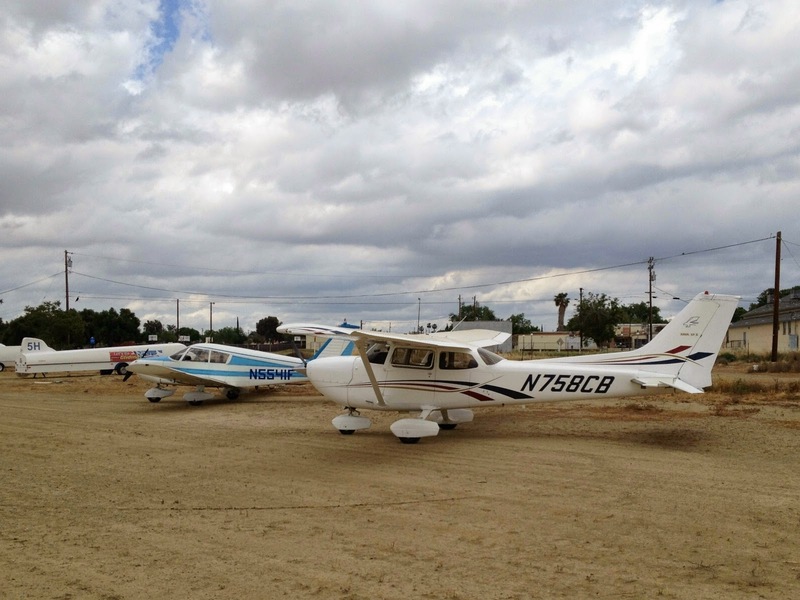 We landed on Rwy 31 and rolled-out to the tie-down area, concluding a very enjoyable local flight just as Harold and crew roared by in the Cherokee 140, Fresno-bound. Nice touchdown on runway 31R at the end of a very nice first flight for Patty. Philip rolled out almost perfectly to the tie-down area just as we departed in the Cherokee. The rain never did arrive over Avenal in spite of being nearly everywhere else. Proves once again that Avenal is in a rain shadow most of the year. We ended the day, after waiting to see how long Philip and Patty would remain aloft, thinking they'd be up there much longer. But as we were taxiing out, they landed and we took off. By that time the wind had softened considerably and clouds to the east were few and far between. At Chandler the wind was a docile 5 knots from the usual 310 degrees. Just to jog your memory, can anyone tell me who is the character in the photo below? 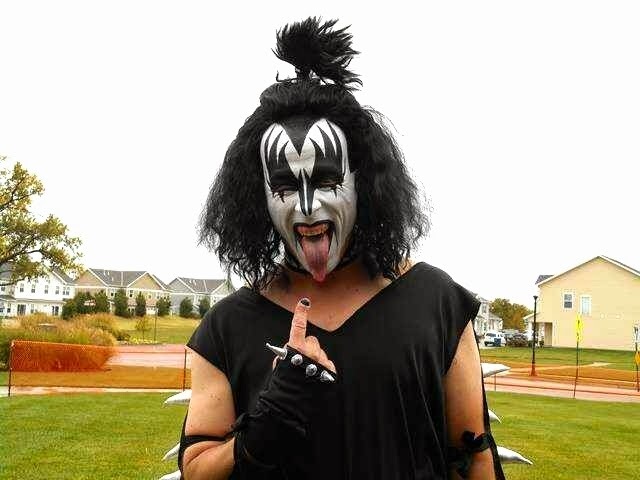 No prizes awarded but plenty of fun and a jog of your rock and roll experiences. Ugly, perhaps, but laughing all the way to the bank. That's all folks. See you on May 2nd with the weather again promising to be very good for soaring.